The General Command of the Armed Forces celebrated the graduation of the 10th batch of National Service recruits, after the end of their three-month basic training period in various training centers, Emirates News Agency WAM reported. During their graduation ceremonies, the graduates presented military shows that confirmed their readiness to defend the nation’s soil with national spirit. They also showcased their skills and their level of infantry training. The recruits will progress to the second stage of their National Service, which is the specialist training stage, where they will be deployed by various units of the Armed Forces. The shows highlighted the morale of the recruits, as well as their loyalty, belonging and love for the nation, and their willingness to defend it and sacrifice themselves for it. In Al Ain, the Armed Forces held three celebrations in the Sieh Al Hama Camp, and the Al Ain 1 and Al Ain 2 training camps for new recruits. 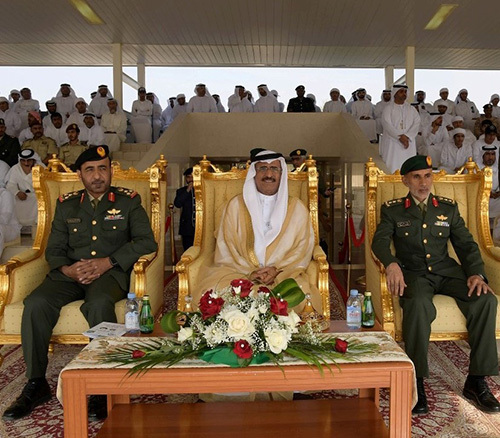 Sultan bin Saeed Al Badi, Minister of Justice, witnessed the graduation of the 10th batch of recruits at the Sieh Al Hama Camp. Dr. Abdullah bin Mohammed Belhaif Al Nuaimi, Minister of Infrastructure Development, witnessed the graduation of the recruits from Training Camp Al Ain 1 while the third graduation of recruits from Training Camp Al Ain 2 was also held, with the attendance of senior Armed Forces officers. Dr. Thani bin Ahmed Al Zeyoudi, Minister of Climate Change and Environment, attended the celebration held by the Armed Forces for the recruits of the training centre in Manama, Ajman. Dr. Ahmad bin Abdullah Humaid Belhoul Al Falasi, Minister of State for Higher Education and Advanced Skills, was the chief guest at the graduation the 10th batch of recruits from the Liwa Training Centre in Al Dhafra Region. In Abu Dhabi, Noura bint Mohammed Al Kaabi, Minister of Culture and Knowledge Development, witnessed the celebration held by the Khawla bint Al Azwar Military School for the graduation of the new batch of female graduates of the 7th National Services and the 56th Newcomers Course, with the attendance of Staff Colonel Afra Saeed Al Falasi, Commander of the Khawla bint Al Azwar Military School.